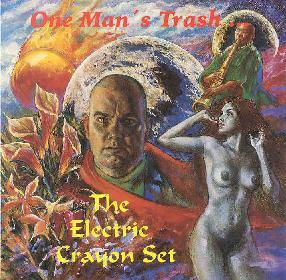 The Electric Crayon Set - "One Man's Trash"
This is a project by Timo Pההkkצ who started a band called the Jennie Tropik Dream in 1999 and recorded two demos and a 7" record. The Electric Crayon Set is the same members of the final lineup that recorded the 7" record on Detour Records. Timo has written all the songs on this project and many of the lyrics have been contributed by Kim Hitchcock from Austin, Texas. It is a concept album with all the songs loosely fitting a story line and all the tracks tied together with sound effects. As the lyrics were not included it is not easy to tell exactly what that story is. Anyway, about the music. It is mainstream American style melodic rock and roll with some flashes of psychedelic things here and there with a little soul, folk and a few hard rock guitars here and there. In general, I did not find that many of the songs really just caught me and made me have to listen to it. A fine release but nothing I could recommend to my psychedelic and space rock friends in the world. For more information you can visit The Electric Crayon Set web site at: http://personal.inet.fi/musiikki/timo.paakko/timo.html. Contact via snail mail c/o SoundHawk; PO Box 118; 28101 Pori, Finland.